Over the weekend my friend Michelle and I had our monthly craft night. We’ve been doing them for over a year now and I still look forward to it every month. If you’ve missed any of our past projects, I’ve created a list at the bottom of the post (we also share our top three projects to date). Anyway, this round of projects includes one of my favorite projects and our biggest #pinterestfail yet. 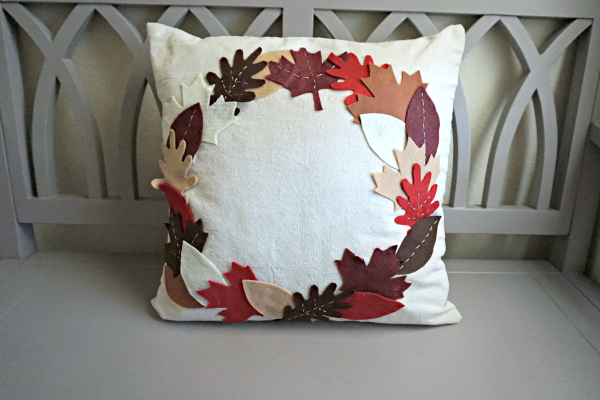 For our August craft night we decided to make fall pillows. We bought the pillow covers at Hobby Lobby (they’re super cheap) and used felt to decorate them. This ended up being one of my favorite projects, but it seriously took for-ev-er. We cut everything by hand (using this leaf template) and then hand stitched the details. I wish I would have had the time (and patience) to stitch details on all of the leaves, but I still love how it turned out. Thanks Handmade in the Heartland for the inspiration! Michelle had to take her pillow home and finish sewing the next day, so this isn’t her finished pillow in the picture. You can see her finished pillow here (or in the 'favorites' section below). 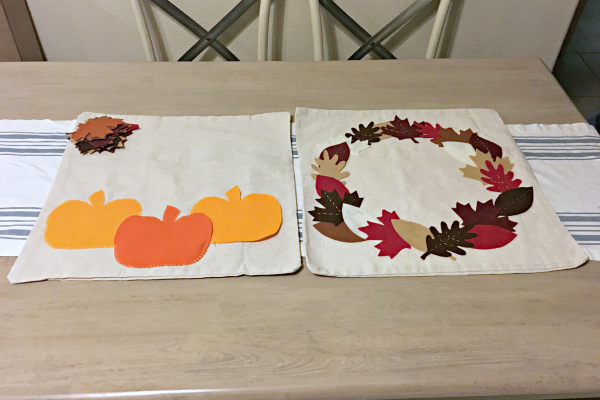 She took the time to hand stitch all of the felt leaves and pumpkins to the pillow cover, so hers should last forever. I used fabric glue to adhere the leaves on mine, so I hope it holds up. The pillow doesn’t get used, so I think it should be fine. 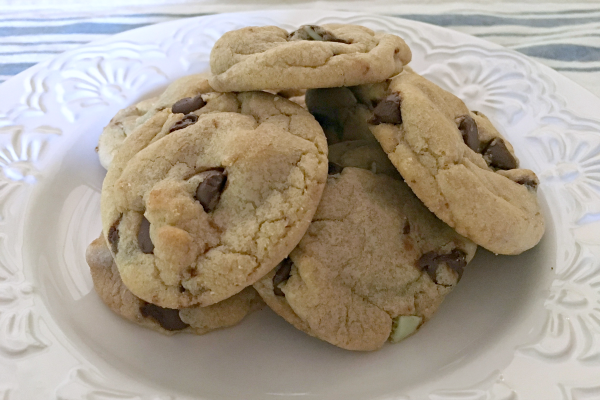 We also baked a batch of mint chocolate chip cookies using a recipe that Michelle had pinned. They were seriously so good. Adam and I ate all of ours by the end of the weekend. September’s craft ended up being our biggest fail yet. 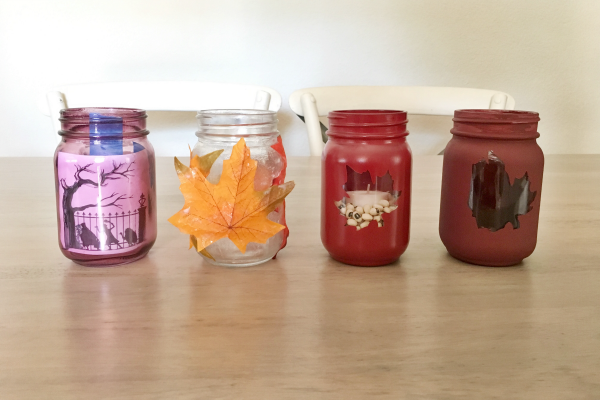 Our project for the month was to paint mason jars for the fall (tutorial here and here). Um yeah, it’s harder than it sounds. We tried acrylic paint, chalk paint and spray paint. The one that I spray painted was the only jar that turned out decent. The other paints just looked too streaky and required way to many coats of paint. Luckily, the acrylic paint and chalk paint washed off easily so we can reuse the jars for another project. 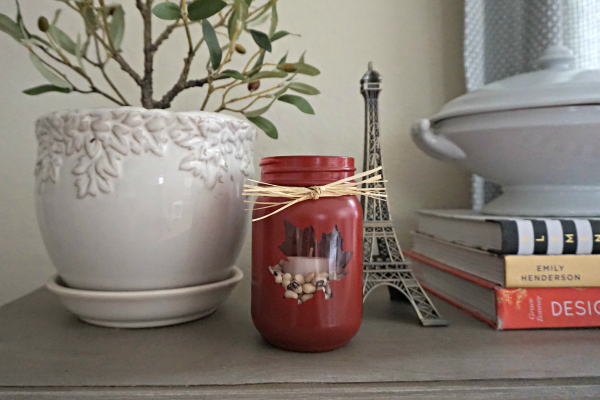 Michelle also tried to decoupage faux leaves onto the jars like this pin, but as you can see, it didn’t work out. They just wouldn’t lay flat on the jar. So we gave up and decided to just meet the guys at a local brewery for a couple drinks. Our craft project didn’t turn out as planned, but it was still a fun day. 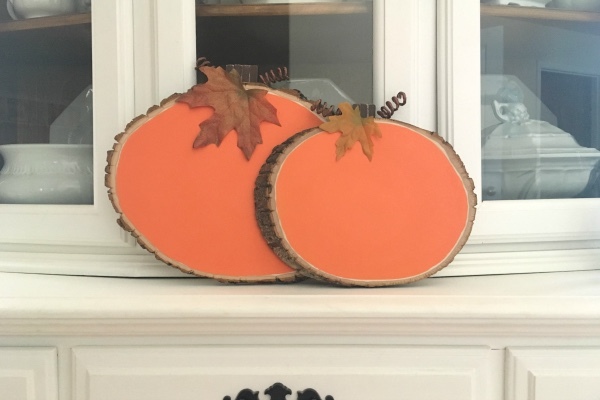 For October we stuck with the fall theme and made wood slice pumpkins using the tutorial from A Night Owl. This ended up being one of our easiest and most straight-forward crafts. Honestly, it was nice to just paint, glue, and be done on time for once. Plus they turned out so cute! Mine are on the right and Michelle's are on the left. I like how she did her leaves on opposite sides of the two pumpkins. I think I'm going pull the leave off of my smaller one and glue it to the other side...one of these days. 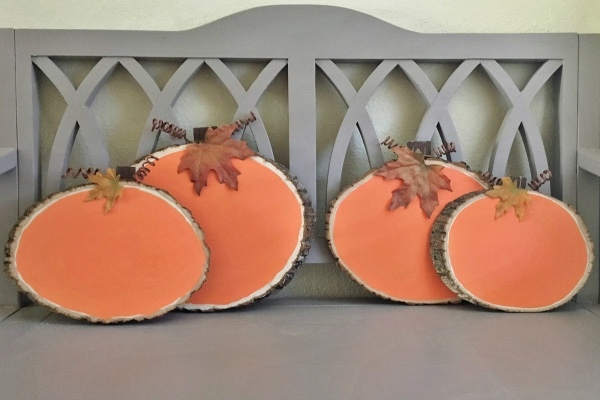 Anyway, if you're looking for a quick, cute fall craft I'd totally recommend this one! 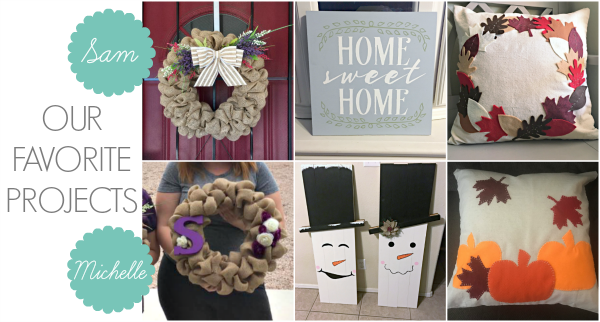 If you’re looking for more craft ideas, check out our shared Monthly Craft Night Pinterest board! The cookies were so good! Adding green food coloring for Christmas is such a fun idea! Super cute crafts! I also love how you get to spend quality time with your girlfriend, while creating awesome crafts. Thanks Ayanna! It's definitely a fun way to spend time together! I have no craft sense! The pillows look great, although I see what you mean about the candle. how can you get the leaf to lay flat? Props for trying. Your girls night craft night sounds good! Yeah, that leaf jar was a total bust. Maybe the leaves would work better on a bigger jar? Thanks! I love how the pillows turned out too! Okay, I need craft nights in my life ASAP. Seriously such a cute idea, I’m loving how those pillows turned out!!! You should plan one! They are such a great way to actually get some projects done! I love crafting, but would probably never do it without our monthly craft nights. The pillows are absolutely darling. I really like the painted wood pieces too! I've never seen that before. Thanks! The pillows are definitely an all-time fave! These are so cute! I want a girlfriend that I can do Pinterest craft nights with! Taking friend applications for this right now! Lol! Too bad you don't live closer! You could come to ours! Thanks! It's one of my favorite projects so far! These pillows are so cute! Im always looking for seasonal substitutes for our couch throws!